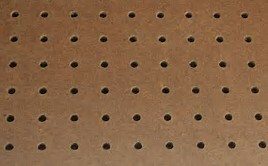 Tempered pegboard available in 1/8″ and 1/4″ thicknesses. Ideal as a furniture component or wall paneling in a workshop or garage. Ideal for hanging tools and merchandise. Has a smooth face and paints well. Sold by the full 4’x8′ sheets only.